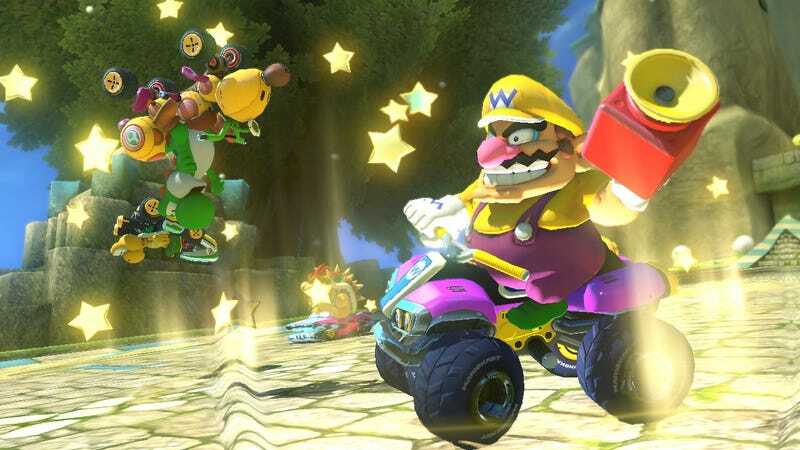 Mario Kart 8 received its first big update at the end of August. Most of the changes were welcome improvements. But one took some time to sink in: the new online ranking system. Now that it has, some players are left feeling confused and upset. If you're playing Mario Kart 8 regularly and didn't notice any major sea-change over the past few weeks, don't worry. You're not alone. Nintendo didn't say much about how it was planning to change its online rankings prior to the update, and they remained decidedly opaque about it when I contacted them for this story. Without much in the way of solid information from the developer itself, high level players have been left to figure it out on their own. And while many of these people sound very upset about several of the adjustments, countless others aren't sure what to make of the new system yet. They can probably tell that something feels different, but they're not sure what, exactly. I play a lot of Mario Kart 8. But I'm not the kind of player who gets all that invested in my online ranking except on the occasions when they seem to undermine the game's matchmaking system—thereby placing me with people who are either far more skilled or far less so. Because of this and Nintendo's silence on the subject, I've had to rely on input I've seen online in forum threads, comments here on Kotaku, and emails players have sent to me directly. Bearing that in mind, let's get to the bottom of this as best we can. Let me start from the beginning here, because Mario Kart 8 didn't begin its life as the kind of game that played up its competitive online multiplayer—at least in comparison to games that are strictly known for that. Players are ranked with what's commonly referred to as a "VR score." This is a number that you see pop up above your racer when you first jump into the online modes, and one that's displayed next to every Mii in a given race. You might be thinking: that's a wide range of scores for a single race! And you'd be right. I'll get to that in a second. But first: notice how the guy in the bottom left went over 10,000? That's the first hint that Mario Kart 8 players got that something was up. Suddenly, players maximum scores could shoot through the roof. The increase in maximum VR scores was the only detail that Nintendo would comment on when I reached out to the company, and that was only to confirm that yes, the Mario Kart 8 developers had added an extra digit. So now instead of maxing out at 9,999, Mario Kart 8 players could ascend as high as 99,999. A higher maximum VR is only meaningful when it applies to the actual gameplay, however, and that's where things start to get confusing. Players also began to notice their VR scores taking a sharp turn—often for the worse. Losing incurred greater penalties, and getting anything lower than first place seemed to reap smaller rewards than before. Since Nintendo wouldn't go into detail about this, I reached out to the next best source I know of for Mario Kart 8 expertise: the man who first hacked the game, known to the internet by his YouTube handle "MrBean35000vr." "I imagine this change was brought about to encourage people to play online more, or rather, the serious players who reached max rank and felt they had nothing else to do," Bean wrote to me in an email. "The scoring system of Mario Kart 8 before [the update] made it so that if you played continuously, you were basically guaranteed to reach the max score of 9,999, as you were basically guaranteed points every race unless you placed in like the bottom 3 (at which point, you'd lose a trivial amount of points and nobody would care). It wasn't particularly good for competition, and was more an indicator of play time rather than skill level." Ok, so Nintendo therefore gave Mario Kart 8 players an increased incentive to play online, and do so competitively. As Bean implied, the original system bugged some players because it felt like the Mario Kart version of grinding—rewarding players for their time spent racing instead of delineating actual performance. Is raising the max VR and tweaking the ways its measured the perfect way to address that concern? Maybe. But once people got wind of they change, they didn't sound too happy. Gamers on popular forums like NeoGAF and GameFAQs (a well-known hub for finding gameplay tips) kicked off strongly-worded threads claiming that Nintendo had "killed" the Mario Kart 8 community, that changing the VR system was "stupid," that it had "literally ruined online play." These players weren't upset about the extra digit Nintendo added to the VR scores, mind you. They were upset about how the VR scores are tallied, regardless of whatever level is possible to attain. Under the new system, many reasoned, VR scores fluctuate too dramatically. Suddenly, players started to see their scores take a sharp nose-dive from which it was exceedingly difficult, if not impossible, to recover. "I lost 30 VR for getting last in a room full of 10,000 VR players, and gained a whopping 3 points for getting 3rd," the player who posted on GameFAQs about VR ruining online play wrote. "I went from 10,100 VR to 9949 in less than half an hour. Why did they have to change something that wasn't broken?" "I'm lucky if I gain any VR points now," the NeoGAF user who said Nintendo had killed Mario Kart 8's community wrote a few days later, making a similar complaint. "If I get second, I usually get 0 points. One time in third place I lost 12 points." "All my mario kart friends no longer play," this player added. "Anytime I see someone who might be higher than me; they're always leaving after a race or two because it's too risky to lose points." Strong reactions, both of these. But I wouldn't describe these and other vocal criticisms as indicative of players' overall feelings about the current state of Mario Kart 8. Many others shot back in the forum threads with suggestions (or jabs) about disaffected players only being pissed because they couldn't cut it online anymore. Also, while a segment of the Mario Kart 8 community clearly feels very strongly about the VR system, there are many others who are indifferent—if they even realize what just happened. One player tried to start an online petition asking Nintendo to "fix the VR system in Mario Kart 8." As of this writing, it's gathered all of 76 signatures—not even reaching the requisite 100 to count by Change.org's standards. Not exactly a groundswell of outrage. I've gone online since the update, and I get paired with people who have like 3000/4000 points and on the same game we are paired with guys that only have 900 or so. I only have around 2000/3000, but as I said at the beginning I don't play now as much as I did before. My own experience has been similar, albeit less dramatic. The biggest change I've felt is just how immediate the changes to my VR score feel. Landing in first place usually gives me a boost of at least 12 points, for instance, so if I'm having a good run in the game I can see my score shoot upwards in a matter of minutes. Take a few wrong turns, though, and it goes right back down. Even if the score itself doesn't really matter to me, having a higher VR ranking still means that I'm more likely to end up with a group of high level players who will crush me in short order. That's no more fun than having to sit around and breeze through races with a bunch of people content to stay around the 1,000-mark. If the original system was too "easy" or "casual" by gamers' (or Nintendo's) standards, the new one feels a bit too...not difficult, exactly. More just stressful. The game still needs to find its Goldilocks balance when it comes to promoting and facilitating online competition. And I hope it does, because when Mario Kart 8 works well online, it continues to be one of my favorite games to play.